Fork pseudostates split an incoming Transition into two or more Transitions terminating in Vertices in orthogonal Regions of a Composite State. The Transitions outgoing from a Fork pseudostate cannot have a guard or a trigger, and the effect behaviors of the individual outgoing Transitions are, at least conceptually, executed concurrently with each other. Join pseudostates are a common target Vertex for two or more Transitions originating from Vertices in different orthogonal Regions. Join pseudostates perform a synchronization function, whereby all incoming Transitions have to complete before execution can continue through an outgoing Transition. 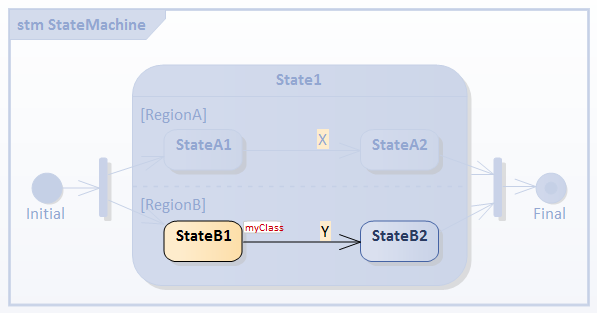 In this example, we demonstrate the behavior of a StateMachine with Fork and Join pseudostates. Note: The contents of this directory will be cleared before generation; make sure you point to a directory that exists only for StateMachine simulation purposes. 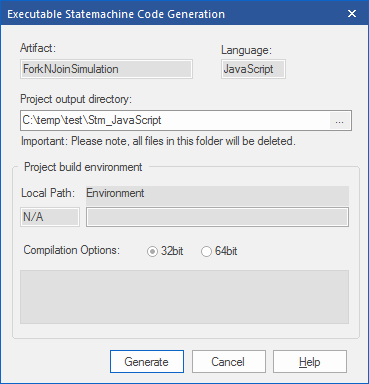 When simulation is started, State1, StateA1 and StateB1 are active and the StateMachine is waiting for events. Select the 'Simulate > Dynamic Simulation > Triggers' ribbon option to display the Simulation Events window. On Trigger event X, StateA1 will exit and enter StateA2; after the entry and doActivity behavior has run, the completion events of StateA2 are dispatched and recalled. 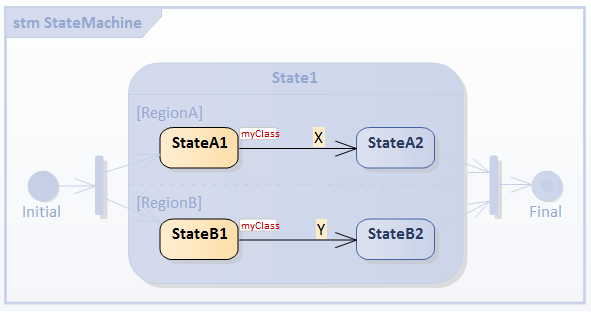 Then the transition from StateA2 to the Join pseudostate is enabled and traversed. Note: Join must wait for all incoming Transitions to complete before execution can continue through an outgoing Transition. Since the branch from RegionB is not complete (because StateB1 is still active and waiting for triggers) the transition from Join to Final will not be executed at this moment. On Trigger event Y, StateB1 will exit and enter StateB2; after the entry and doActivity behavior has run, completion events of StateB2 are dispatched and recalled. 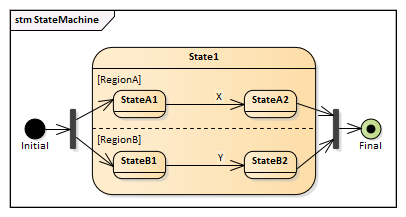 Then the transition from StateB2 to the Join pseudostate is enabled and traversed. This satisfies the criteria of all the incoming transitions of Join having completed, so the transition from Join to Final is executed. Simulation has ended. Tips: You can view the execution trace sequence from the Simulation window (Simulate > Dynamic Simulation > Simulator > Open Simulation Window).